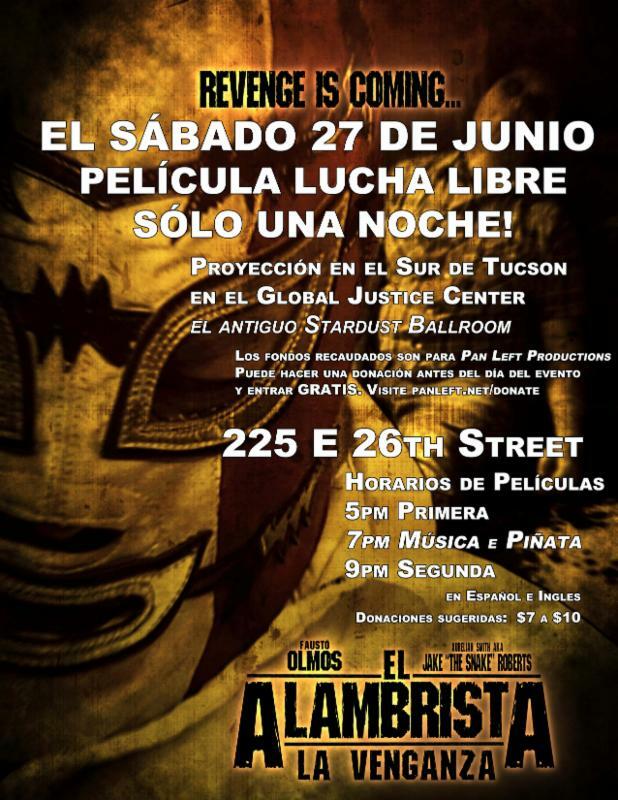 Seeing is believing in this B-movie Mexican wrestling adventure from local filmmaker Alfonso Sahagun Casaus and we are excited to be showing hosting this fundraiser screening in South Tucson at our home in the Global Justice Center. Film is in both Spanish and English. We’re also giving donors this month Free entrance. Make a donation to Pan Left here panleft.net/donate EVENT details on Facebookhttps://www.facebook.com/events/118159755182016/ See you at the screening! 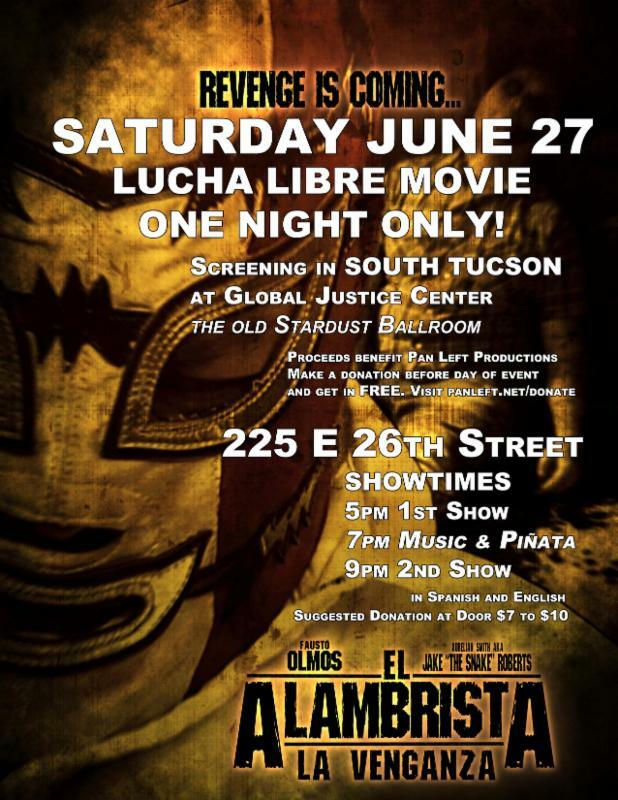 Pan Left Productions hosts the South Tucson screening of EL ALAMBRISTA LA VENGANZA. Watch El Alambrista fight for justice at the U.S./Mexico Border! It’s an action packed “Machete” style movie with Lucha Libre breaking borders including local Nogales Luchadores and Hall of Fame wrestler, Jake “The Snake” Roberts. Directed by Alfonso Sahagun Casaus, a local Tucson filmmaker and native son from Douglas-Agua Prieta. This sequel to “El Alambrista” features more action, more FX, and much more exciting sights and sounds of people from the border. In this adventure El Alambrista fights border vigilantes, rescues migrants, and defends himself from his enemies. El Alambrista en la Lucha! Viva la Raza! Don’t miss it!Two screenings! Music and Piñata! One Night Only! Pan Left has for over 21 years provided free access to media equipment and resources for our community working for social justice. Your support keeps us going! Los fondos recaudados son para Pan Left Productions Puede hacer una donación antes del día del evento y entrar GRATIS. For over 20 years, Pan Left Productions has been giving free media tools to people telling their own stories from our communities, and we do it with your support. Please help keep our cameras rolling. Make a donation here.